It’s a good thing the Egyptians believed strongly in an afterlife and wanted to make sure their dead had an ample supply of bread. The bread and the tomb inscriptions tell us something about how grain was grown and bread baked. To really understand the process, however, you need to be a practical-minded archaeologist like Delwen Samuel, who first set out to replicate Egyptian bread. Photo of a model from the tomb of Meketre, Metropolitan Musdeum of Art, Rogers Fund and Edward S. Harkness Gift, 1920.
my curiosEATy liked this article on twitter.com. 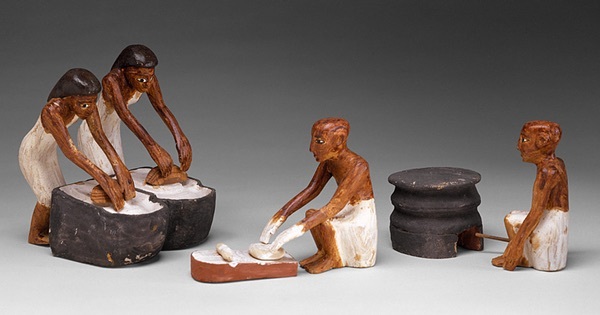 How Delwen Samuel, an archaeologist, replicated the bread of Egyptian workers of 3000 years ago. This is the episode that should have been called Bake Like an Egyptian.